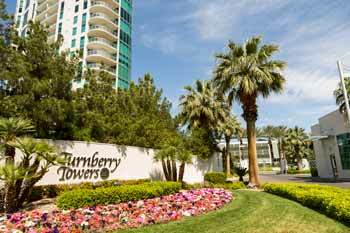 Turnberry Towers includes two 45-story residential towers located just one block north and one block east of the famed Las Vegas strip. Highrise residences here are some of the most elegant and luxurious properties available in the city, offering serene high-class living high above the street but just minutes away from a nearly infinite array of shopping, dining, and entertainment possibilities. 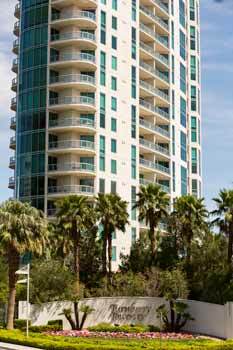 Each tower consists of 318 units with a total of four floor plans. The one-bedroom condos have spacious, open floor plans and private balconies. The two-bedroom condos run down the center of each floor, offering both north and south views. The two-bedroom floor plan with a den is situated between two corner walls with a stunning wrap-around view of more than 180 degrees. 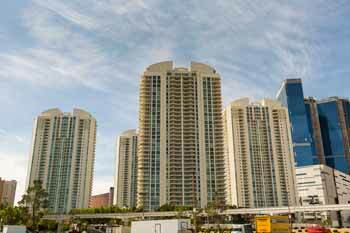 The largest and most luxurious three-bedroom homes are only found on the 33rd floor and above. These generously apportioned condos get breathtaking sunset views. All of the homes are designed with top-of-the-line materials, finishes, and brand names in cabinetry, fixtures, countertops, and flooring. 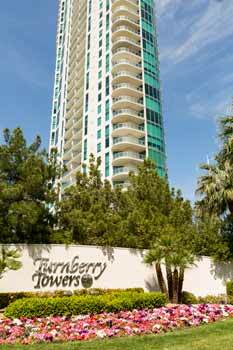 Residents of the Turnberry Towers enjoy many amenities designed to make everyday life feel like a resort vacation. After a day of shopping, residents simply drive up to the lobby (after passing through a well-guarded entrance), hand off the keys to a valet, and take an elevator directly to their door. With 24/7 concierge service, anything can be taken care of with a quick call to the lobby. Dry cleaning can be sent out, groceries delivered in, and tickets procured for the hottest shows in town. The beautifully landscaped 10-acre property also includes an extra-large pool with a waterfall, tennis courts, a fitness center, a club room, and a spa. 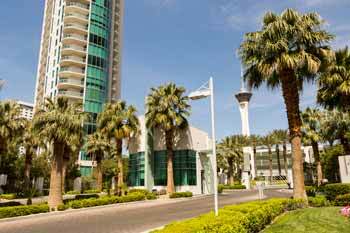 While relaxing in the pool or having a glass of wine on a 40th-floor balcony, residents can easily forget they're just minutes away from all the commotion of the Las Vegas strip. A quick review of the owners list here shows both local, out-of-state, and international clientele. Many people, in fact, purchase a high-rise condo as a second home, making it easy to spend their weekends where they like to have fun and entertain friends. To see the most elegant condos in downtown Las Vegas, simply contact us or click the button below to see all the listings!